High performance acoustic linings from Gyproc Middle East are helping theatre goers at Dubai’s newly opened showpiece theatre to get the most from a planned programme of performances that will stretch from opera and ballet to rock concerts. Inspired by the shape of the Middle East’s traditional sailing vessel, the dhow, the iconic Dubai Opera building is far from a traditional arts centre. Using a series of hydraulic lifts and seating wagons, the 2000-seat hall can be transformed from concert venue to theatre, to ‘flat floor’ banquet hall or exhibition space, ready to host a wide range of different event formats. Internal acoustics within the different spaces were crucial to support the world -leading artists and productions and ensure that every audience member could clearly distinguish speech and music regardless of their position within the theatre. This meant that linings to walls and ceilings had to achieve the optimum balance between sound insulation, in order to mask external noise, and sound absorption/reverberation to manage the way that sound carried within the space. Gyproc’s lightweight systems were chosen because their lightweight construction and high performance plasterboard linings means they are much more efficient at sound insulation performance than equivalent solid or heavy blockwork alternatives. Dubai-based interiors and fit-out specialist, Cloisall Co., installed high performance acoustic linings, including GypLyner IWL using double layer of Gyproc DuraLine boards which helps in providing greater acoustic performance along with higher impact resistance, a fully independent metal frame lining which is installed directly to the floor and soffit to minimise sound transmission through the wall structure, and Gyproc ShaftWall, a system developed to meet the rigorous acoustic and fire performance demands of high speed lift shafts and risers. To complete the specification, Gyproc MF, a fully concealed suspended metal grid system that is lined with plasterboard to create a seamless monolithic appearance has been used for ceilings throughout the building. The Gyproc systems, valued at almost AED ¾ million, were supplied to the project by local distributor, SIG Middle East, to meet the client Emaar Properties PJSC’s demanding build schedule. 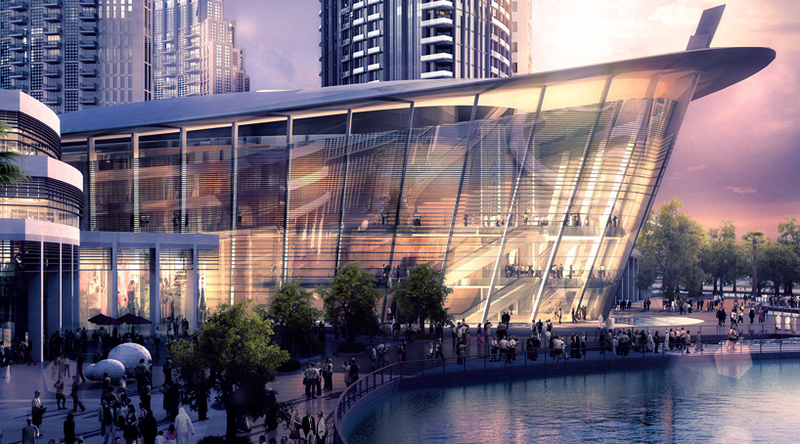 Inaugurated on August 31 with an opening concert by world-leading tenor, Placido Domingo, Dubai Opera is the Emirate’s first major performing arts centre and is expected to act as a springboard for Dubai’s new cultural scene.